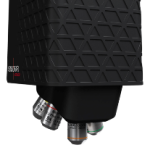 The S neox from Sensofar has been designed for non-contact optical 3D profiling. It uses a high-resolution CCD sensor of up to 1360 x 1024 pixels, along with high-resolution displays of 2560 x 1440. Combining three techniques – Confocal, Interferometry and Focus Variation – in one device ensures that the S neox can outperform existing optical profilers. The four LED light sources within the optical core of the S neox are red at 630 nm, green at 530 nm, blue at 460 nm, and white. These help to provide the requisite optical coherence length and lateral resolution for the optical technique chosen. Shorter wavelengths are necessary in applications where the highest lateral resolution is needed, while longer wavelengths can achieve greater optical coherence of up to 20 µm, thereby making Phase Shifting Interferometry possible on large area smooth surfaces. Another essential feature of the LEDs is that they are pulsed to obtain real color images and high-contrast color-coded depth data in real time. The colored LEDs are used to consecutively light up the surface under inspection, generating three monochromatic images, which can be combined into a single high-resolution color image. This technique results in high saturation and color fidelity. The S neox is a flexible tool, and can be used in applications ranging from a basic setup for R&D and quality inspection laboratories, through to advanced, customized solutions for online process controls. 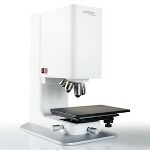 The system is able to measure samples up to 700 x 600 mm2. The S neox integrates Confocal, Interferometry and Focus Variation methods in the same sensor head without any moving components. Confocal profilers measure the height of smooth to rough surfaces. Confocal profiling provides the best lateral resolution possible with an optical profiler, allowing spatial sampling to be reduced to 0.10 µm. The PSI phase shift interferometers measure the surface height of smooth and continuous surfaces with sub-nanometer resolution. 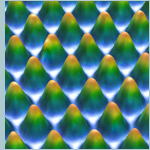 PSI profiling is capable of providing sub-nanometer vertical resolution for all numerical apertures (NA). The VSI white-light vertical scanning interferometers can measure the surface height of smooth to fairly rough surfaces. VSI profiling enables nanometer vertical resolution for all NAs. The VSI algorithms allow the S neox to use all available magnifications for profiling shape features with the same height resolution. Focus variation is an optical technology used for measuring the shape of large, rough surfaces. This technology is based on Sensofar’s experience in the field of combined confocal and interferometric 3D measurements. 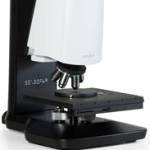 It is particularly designed to supplement confocal measurements at low magnification. The key benefits of this technology include very high measurement speeds, high slope surfaces, and a large vertical range. Combined, these capabilities are ideal for use in tooling applications. 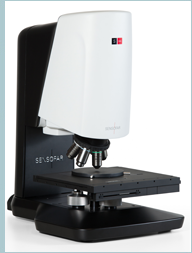 Sensofar’s patented technology, based on a microdisplay, is used by the S neox for confocal scanning. The basis of the microdisplay is ferroelectric liquid crystal on silicon (FLCoS), which is a rapidly switching device having no moving components, thus enabling rapid and highly stable scanning of confocal images with an unlimited lifetime. Generates real color images and high-contrast color-coded depth information in real time. Compact design suitable for obtaining rapid, non-invasive measurement of the micro- and nanogeometry of technical surfaces in many configurations. Rapid 3D scanning - a complete 3D scan can be done in less than 10 seconds. For very low reflective surfaces and high-speed applications, 2x2 pixel binning enables a full 3D scan in less than 3 seconds. Optional spectroscopic reflectometer can measure thin films with thicknesses ranging from 10 nm and up to 10 layer stacks. Premium CF60-2 Nikon objectives lenses to correct chromatic aberrations and generate clear, flat and distinct images with high resolution and high contrast. Phase Fresnel lenses provide the maximum available working distance for all NAs. SensoSCAN Software has an intuitive and user-friendly interface with which measurements can be taken. The overview tool assists the user in sample preparation, positioning and the automation procedure. The Recipes tool allows user to create quality control procedures to automate measurements. SensoPRO LT software is easily customizable and can be used with the S neox to simplify production line quality control, with applications including PSS module, roughness and step height. SensoMAP software can be used with the S neox for analysis and reporting. 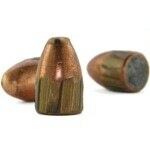 It can be adapted to customer requirements. Several modules are available including 2D, 3D or 4D, Advanced Contour, and Grains and Particles.